Please find some of our FAQs below. If you can't find the answer you are looking for, don't hesitate to contact us. Q. Am I fit enough? The women who come to the camp are all different shapes and sizes, with varying levels of fitness. We assess everyone on arrival, and pitch the activities so that each individual works to their own physical limit. You will be expected to work at a high intensity to gain the very best results, but in a safe and controlled environment. Q. Can I smoke at camp? Smoking is allowed in designated outdoor areas at the Lodge during free time in the evening. Q. Can I use my mobile? Depending on reception, mobiles can be used in the Lodge during free time in the evening. The cost for a week is from £995.00 based on the room type you select. This includes all accommodation and food, a varied and comprehensive fitness programme led by fully experienced military training instructors, coaching & motivational sessions, and return travel to the lodge from the central meeting point in Inverness. Most rooms are twin-bedded, though single rooms are available at additional charge. The only additional extras are the therapeutic treatments available in the evenings (see Boot Camp Therapies). The amount or weight or inches lost will vary from one person to another. It depends on your height, weight, existing BMI and current activity levels. One thing is for certain though, your time at Scottish Boot Camp will transform your energy levels, create a great positive attitude, and give you the motivation to continue working to your weight loss and fitness goals when you leave. Q. I don't want to lose weight, just get fit. Can I still come? Whilst we do not accept women who would become underweight if they came to camp, we can cater for healthy clients who just want to increase their fitness and level of conditioning. The nutrition plan would be adapted accordingly so you would not lose weight. Q. I have injuries, allergies or other medical condition? You must make us fully aware of any medical condition you have on the Medical History Form which will be completed prior to your arrival. We would also require a letter signed by your doctor to confirm that he is happy for you to attend Scottish Boot Camp. Activities and nutrition may then successfully be adapted to your needs so you can still enjoy your week on camp. A full kit list will be issued along with the booking confirmation. The clothing requirements will vary depending on the season, but we will advise you at the time. 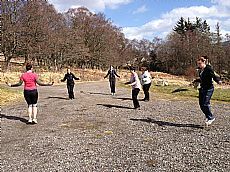 Scottish Boot Camp provides all exercise equipment for the planned activities. Aim to arrive in Inverness between 14.00hrs and 15.00hrs on the first Saturday of the course. We arrange a central venue for everyone to meet and transport you to the Lodge when the first exercise begins at 16.00hrs. All details are confirmed to you at the time of booking. The course will end at 10.00hrs the following Saturday after roll call and final weigh-in, when we will again drop you back in Inverness for your return journey. Q. Who will I share a room with? Most of the women who arrive at boot camp are on their own and room in with a fellow camper. This can be very supportive and help forge great friendships. We do also have single room accommodation for those who prefer, at an additional supplement. Q. Can I spread the cost of my boot camp? Yes, you can spread the cost of your boot camp week into 3 easy payments and make coming to camp a reality at no extra premium. For more details on the easy payment plan call one of the team on 01463 800 427. Either fill in your details on the ‘Contact Us’ page and one of the team will give you a call back, or call Scottish Boot Camp directly on 01463 800 427 to book you place. Cancellation charges will apply if you need to cancel your place (please refer to Terms & Conditions). However, we appreciate that sometimes unforeseen circumstances leave you with no option but to cancel, in which case we will do our best to fill your place and transfer you to another course. A deposit of 30% is required when you book, with the outstanding balance payable 6 weeks before you arrive. We accept payment by cheque, paypal or bank transfer (which you can complete online or at your local bank). Highland RIBS - a 'must have' experience out on the water. Find our listing on EasyBedandBreakfasts.co.uk which is a Guest House guide, which includes a B and B Tain page.